Pumpkin MagicThe delicious Pumpkin Spice Latte and magical new Pumpkin Spice Tea Latte have arrived.Any size $2.99Text TULLYS to 20123 to start receiving special deals on all your favorite Tully's beverages, products and food! 80 Minutes $139 (regular price $175)Click here to download coupon! Now through October 31, it's Trick or Treat All-You-Can-Eat Pancakes at IHOP! 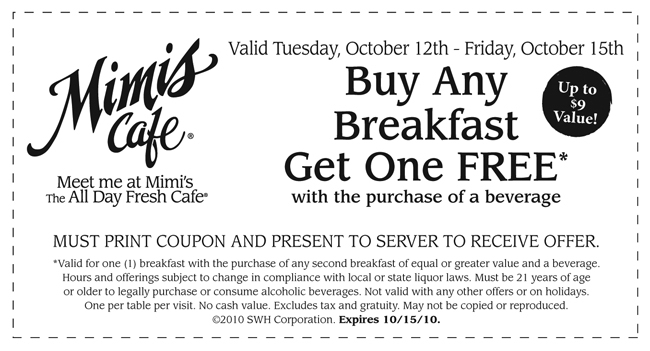 Enjoy two of our fluffy buttermilk pancakes served with all your favorites and starting at just $4.99. Then we'll bring you more pancakes, three at at time, until you've had your fill! At participating locations for a limited time only. Visit www.ihop.com for more information. 30% off Gap, Old Navy, Banana Republic (ends 10/5!) online only!